All POSTPAID items ship separately via USPS Priority Mail. Postage is included in the prices shown. High Quality Silkworm Cocoons - Lot of 25 and up - price includes USPS priority mail shipping! Silkworm Cocoons (dehydrated, non-living) - 25 count -- FREE SHIPPING! Silkworm Cocoons (dehydrated, non-living) - 100 count -- FREE SHIPPING! Silkworm Cocoons (dehydrated, non-living) - 500 Count, 39 cents ea. -- FREE SHIPPING! 50 PERCENT OFF SALE (LTD TIME OFFER!)!! Silkworm Cocoons (dehydrated, non-living) - 1000 Count, 35 cents ea. -- FREE SHIPPING! 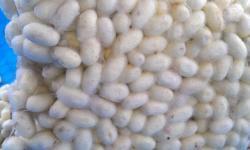 High Quality Silkworm Cocoons - EMAIL US FOR BULK COCOON PRICING! !